With a large female red-tailed hawk on his glove, a falconer arrived at the Boarman Discovery Center on November 28 to talk to Lower School students about his bird and the art of falconry. Skadi, a female red-tailed hawk, and her trainer, Tristan Engelke, thrilled Lower School students in Mark Walter's STEM classroom. 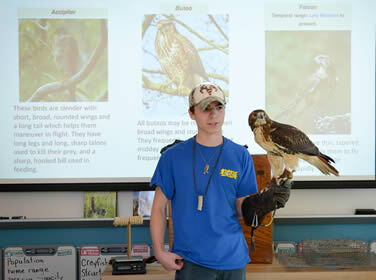 Tristan, 16, an apprentice falconer in Maryland, spoke about red-tailed hawks (genus Buteo, a bird of prey or raptor fairly common in North America) and explained some basics of falconry, including training and caring for the birds as well as hunting with them. Third grade students as well as students in Kindergarten, 2nd, and 4th grades were fascinated to observe Skadi, an 18-month-old hawk named for the Norse goddess of winter and hunting, who sat calmly on her trainer's thick leather glove. Tristan explained that Skadi wore leather anklets and belled jesses attached to a short leash; by wrapping the jesses around his fingers, he kept a firm grip while the bird's powerful talons gripped the glove. Skadi is a large female weighing just under three pounds, and, with the intelligence of her kind, she quickly trained to the glove and grew accustomed to the falconer. Students learned that the art of falconry began in ancient times, flourished in the medieval era, and still thrives today. Many of the training techniques he uses, Tristan explained, were established centuries ago. The hawk looked around the classroom with alert golden eyes as the students learned that vision is a hawk's keenest sense, and that falconers can calm a trained bird by hooding it or putting it in a dark place to remove vision, allowing the bird respite from visual stimulation. Skadi sometimes "bated" by flapping her wings, showing the broad "fingered" wings characteristic of a hawk, to express her nervousness at being in a large group of people. When she roused her feathers, she indicated that she was more relaxed. Red-tailed hawks are among the calmest and steadiest of birds of prey and therefore are easier to train, Tristan explained. He had carefully trapped her as a passage bird (a young bird of prey that has left the nest and is under a year old) in compliance with state requirements of licensed falconers; the Migratory Bird Treaty Act and the Maryland Department of Natural Resources impose strict regulations that protect hawks, falcons, accipiters and other birds of prey. He worked patiently with her to gain the trust of the wild bird, "manning" her by carrying her around continually and showing her that he was a reliable source of protection and food. A trainer can gain the cooperation of a bird of prey, although they always remain wild, Tristan emphasized. 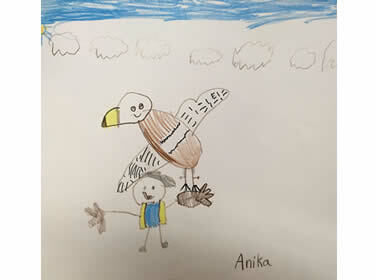 Watching quietly and asking excellent questions, the Lower Schoolers took notes and made drawings of the hawk. Tristan showed them some of Skadi's molted feathers and explained that birds of prey molt their feathers in the summer, gaining new ones that are often darker as the bird ages. The students' questions ranged from wondering what Skadi ate (she especially likes mice, rabbits, and squirrels), how she hunted (she prefers to sit high in a tree and watch for small animals on the ground), and how the falconer flew her—by releasing her from the glove, and trusting that if she was hungry enough, she would come back to him; even a trained hawk may fly off. Students wanted to know if male hawks are faster and fiercer than females, and were surprised to learn that female hawks, falcons, and other birds of prey tend to be larger than males, and faster, better hunters. Students were fascinated to learn, also, that Skadi once flew far away from her falconer, but he was able to follow her by the sound of the bells on her jesses. Finally he convinced her to return by spinning a lure, a packet of fresh meat on a long string, which she saw from nearly a mile away. 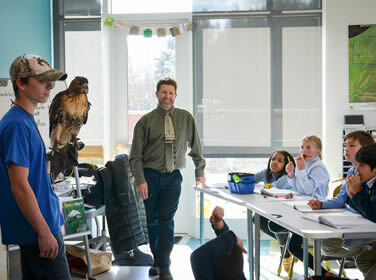 "It's important to remember," teacher Mark Walter told the students, "that this bird is not a pet. This is a wild animal, and she will always be wild. And what Tristan is sharing with us today is very special." What will happen to Skadi? Tristan Engelke will release her back to the wild in the spring, when she is two years old, in compliance with state protective laws. Later in the year he will trap another passage bird and train her. He will greatly miss Skadi, who is his first trained bird. "I made a few mistakes with this bird, and she has taught me a lot," Tristan told the students. "I will let her go back to the wild, and I will keep learning." He will continue his apprenticeship and become a master falconer one day.